Promenada, the biggest shopping center in Serbia and this part of Europe, is slowly emerging from the most expensive land in Novi Sad at the corner of the Oslobodjenja Blvd and the Cara Lazara Blvd. The construction workers, who are making use of the unusually warm days for this time of year, have already made considerable progress in raising the first aboveground elevation of the center, Novosti reports. 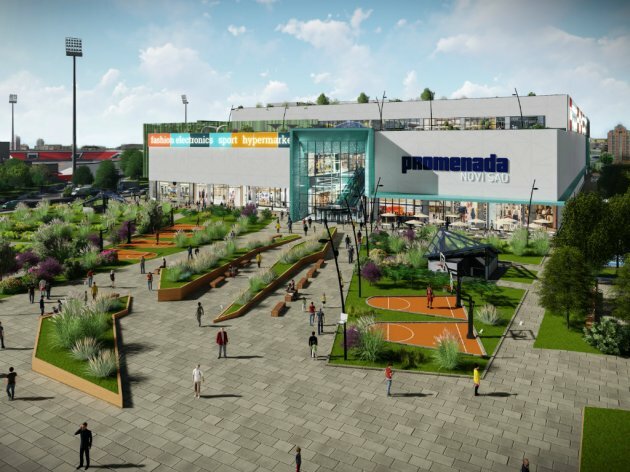 The opening of Promenada, which should have an area of over 140,000 m2, of which 50,000 m2 is meant for leasing, is planned to take place by the end of this year, but, as investors from NEPI estimate, the works might be completed even earlier. – We’ve had the luck to complete the most complex part of the job without any problems, namely, the construction of the underground tiers, and what lies ahead now is the easier part of the job – NEPI says with satisfaction. – The floor construction is being raised and the works are almost ahead of the schedule. Under any kind of weather conditions, there are 500 workers at the construction site, and sometimes even more – the contractors say. The shopping mall, designed by the architect Djordje Bajilo, should welcome the first customers by December 5, according to plans, and around 1,500 are expected to be employed at Promenada, as the biggest global store chains are already interested in this attractive location. – The people and guests of Novi Sad will now be able to buy their next New Year’s presents at Promenada, in stores of the biggest global brands – NEPI says. – Local companies, including local ones, are aware of the importance of the new center we’re building. Of course, along with commercial space, there will also be room for hospitality and entertainment features and Promenada will therefore justify its name.